The tea drink: The heat has been getting less deadly around here lately (or else my mother’s been turning the air conditioning up higher), but nevertheless it’s a little too toasty for anything hot. 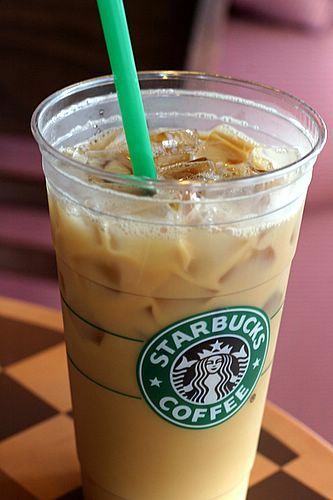 So instead, I had an iced coffee from Starbucks! Hazelnut flavored, and it was quite disgusting. I managed to fix it a bit with some vanilla flavored soy milk, but it was still nearly too horrible to finish drinking. I won’t be getting that flavor again. The book: I’m still working my way through the Amelia Peabody books, though I’ve run into a few snags as my nearest library has only #1-4 (and some miscellaneous others), and so I’ve had to interlibrary loan #5 and up. Can fear kill? There are those who believe so–but Amelia Peabody is skeptical. A respected Egyptologist and amateur sleuth, Amelia has foiled felonious schemes from Victoria’s England to the Middle East. And she doubts that it was a Nineteenth-Dynasty mummy’s curse that caused the death of a night watchman in the British Museum. The corpse was found sprawled in the mummy’s shadow, a look of terror frozen on the guard’s face. What–or who–killed the unfortunate man is a mystery that seems too intriguingly delicious for Amelia to pass up, especially now that she, her dashing archaeologist husband, Emerson, and their precocious son, Ramses, are back on Britain’s shores. But a contemporary curse can be as lethal as one centuries old–and the foggy London thoroughfares can be as treacherous as the narrow, twisting alleyways of Cairo after dark–when a perpetrator of evil deeds sets his murderous sights on his relentless pursuer…Amelia Peabody! Do they go together? In theory I think they go together, but I disliked the coffee so much that I’m a little iffy to actually say it. Maybe the peppermint flavored coffee would have gone over better– something a little perky and refreshing instead of BLECH. Oh! Or maybe mocha. Mmmm, mocha. I did enjoy Deeds of the Disturber a lot! Percy’s so loathsome. Er, but just to let you know, the next one, the sixth, is a bit weird. If you haven’t read anything by H. Rider Haggard, it’s very very weird – don’t be put off if you don’t like it! I think she was a little off form on the sixth and seventh book, but the eighth one is wonderful (maybe my favorite??? I can never decide).